The 6th annual Future of Food and Nutrition Graduate Student Research Conference is quickly approaching. If you’re a first-year Friedman student, like me, you may have heard rumblings about the upcoming event, but perhaps you are just as clueless as I am about what it entails. For this reason, I met up with Johanna Andrews and Brooke Smith, co-chairs of the event. They were filled with practical and exciting information about the upcoming conference. Abstracts are due soon (February 10), so keep reading if you think you may be interested in participating! What is the Future of Food and Nutrition Graduate Student Research Conference? This student run conference is a venue for students to present original research from any discipline related to food and nutrition. This year’s title is “7 Billion Strong: Approaches to Feeding the World.” This topic was chosen because members of the team felt it was important to recognize that our population recently hit 7 billion people and the importance of nutrition in our rapidly growing population. The conference is organized by ten graduate students from the Tufts University Friedman School of Nutrition Science and Policy. Who participates and who attends? This is a student-focused conference, showcasing student research from universities across the country. Although Friedman hosts the event, you can expect to see research from a wide range of schools. Students, professors, and professionals from the field attend the event. 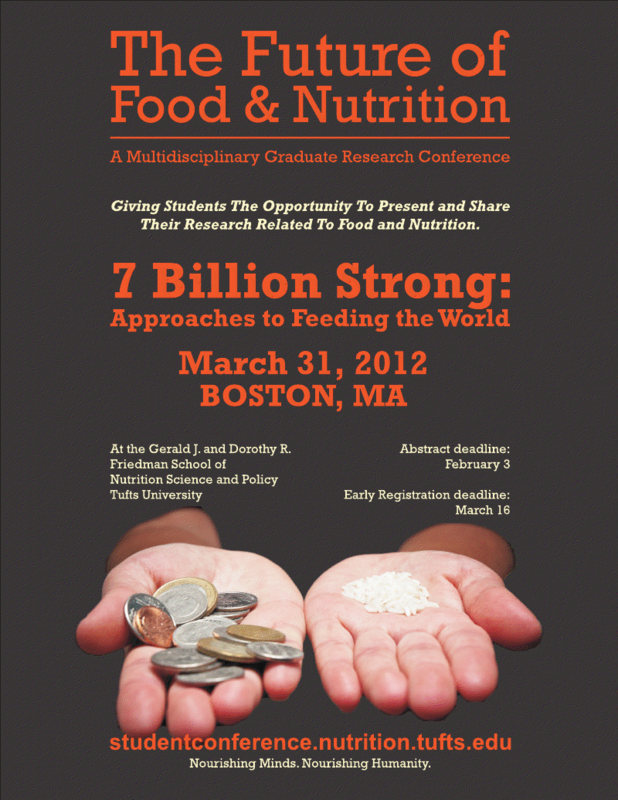 The conference will be held March 31, 2012 at the Gerald J. and Dorothy R. Friedman School of Nutrition Science and Policy at 150 Harrison Ave, Boston, MA 02111. The abstract submission deadline has been extended to February 10, 2012. To submit an abstract use the online form or email the abstract submission form to friedmansrc@gmail.com. If you’d like to attend the event, sign up by March 16th to take advantage of the discounted early bird rate of $25.00. After that, admission will be $35.00. Breakfast, snacks and lunch are included in the registration fee. You can register here. Anything else you would like to share about the conference? Last year, over 200 graduate students came together to hear students from 28 universities present research from fields as diverse as anthropology and nutritional epidemiology! Check for ongoing updates here. Have any questions? Email the conference committee at: friedmansrc@gmail.com. Lainey is a first year Nutrition Communication student and registered dietitian. She enjoys writing about various events around Boston and Friedman. When not event-hopping or writing, she enjoys working at her jewelry business – Stella and Dot.